A lot of media attention naturally goes to the quarterbacks at this point in the season. Much of it this week has shone on Joe Flacco in particular. While it's true he didn't light up the scoreboard like the other three QBs did last week, he was the only one playing against one of the league's best defenses. The others faced the 17th, 22nd, and 29th ranked defenses in terms of overall efficiency. A lot of the debate on Flacco has revolved around the notion that he just wins. I hear a lot of people cite his overall win-loss record as a starter as well as mentioning he has a very good defense backing him up. On one hand he's been to the playoffs 4 out of his 4 seasons, but on the other he's not the reason the Ravens win. Win Probability Added seems it was made to settle debates just like this. And WPA says that since his second season in the league, Flacco is one of the main reasons why the Ravens have been a winning team. In fact, over his entire career his WPA has averaged +0.10 per game. And his last two seasons were +0.21 and +0.19 WPA, well above average. In other words, his performance would make a .500 team a .700 team, all other things being equal. But not everything is equal. In particular, quarterbacks naturally have positive WPA simply because passing is more lucrative than running, plus it's been getting easier over time. So let's compare apples to apples. I created a special version of the QB Career visualizations that only feature the four remaining playoff QBs. Here's how their WPA has accumulated through their playing careers. You might be surprised at Flacco's trajectory. He's apparently on pace for the Hall of Fame. I'm only kidding, but keep in mind how slowly Tom Brady's career started. Brady was actually an average passer in the early Super Bowl years. His statistical explosion didn't come until 2004, when his Expected Points Added (EPA) tripled from the year before. 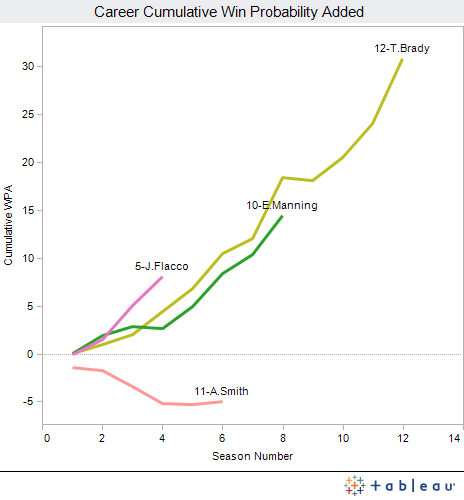 This graph is a little misleading because Brady did not play his first year as Flacco did. Still, Flacco has improved over time just as Brady has. And as Brady was handed more weapons such as Randy Moss, Wes Welker, and now Rob Gronkowski, Brady's numbers followed suit. It's also interesting that Flacco's trajectory is significantly above that of Eli Manning, who is widely considered to have developed into one of the best in the league. I am not claiming Flacco is the next Brady. My point is this: Overall, Flacco is not among the current elite QBs in most ways, but he's better than most give him credit. He helps more than he hurts, and he's one of the several reasons for the Ravens' string of playoff appearances. And if his career continues with as much good fortune as it began, he could still develop into one of the league's premier passers. Here's where you can find the full interactive QB visualizations, where you can choose your own set of QBs. Also take a glance at the "Nth Best" Career EPA page, which shows just how far Flacco would have to go to match the numbers of the game's best. Full disclosure--I own a #5 Flacco t-shirt, and I'm sporting a very cool Fu Manchu this month. I've noticed -- and I think most Ravens fans have as well, based on the complaints I've heard -- that the Ravens call more passes than you'd expect from a team that's above average running (4.3 yards per carry) and below average passing (5.0 AYPA). While this playcalling may be rational, it's not the average fan expects to see. So what this makes me wonder is, does Flacco's high total WPA number reflect the coaches' tendencies more than his own effectiveness as a passer? Put another way, is he something of a "volume scorer" in this category? As a baseball SABR/FanGraphs guy, I'm a big fan of your NFL WPA and EPA calculations. However, with football being a team game, it is important to realize that when one says "Joe Flacco is worth 70EPA and 3.3 WPA", one is really saying "When Joe Flacco drops back to pass, the result for the Ravens offense was 70 EPA and 3.3 WPA." The credit ascribed to Flacco is the cumulative effort of his entire offense - WR, TE, RB, Line and all, not the more player-specific batting or pitching stats of baseball. The Ravens pass offense is mediocre (.11 EPA/P 14th, 5.0 AYPA 20th, 44.6% 21st) but effective enough to rack up WPA in the close games that are enabled by the Ravens excellent defense. Consistently mediocre is hard to deliver in the NFL, so I would give Flacco more credit for his constancy than his performance. The Bay Area (where I live) is just waking up from a decade long nightmare of way-sub-medicore QB play where Flacco would have seemed a great improvement. Baltimore's run stats like YPC were skewed this year by two 50+ and two 70+ yard runs. You can average 4.3 YPC with 25 2yd runs and one 60, or with six 5yd runs and one no gain - the former creates lots of 3rd and long, while latter is far more valuable in terms of EPA and WPA. This site has them at 0.0 EPA/P on the season (12th in NFL), and 42.6% Success Rate, 19th. With the Ravens playing in low scoring games, the marginal value of EPA greater. Since the pass attack is a little above mediocre, it is getting the bulk of the WPA credit for its greater EPA contribution (60 vs 1 EPA). Concur. Always good to remind ourselves of that. BAL's running game is overrated. Has been for years. Not sure how it got the reputation it does, except maybe Jamal Lewis' insane 2003. But that was a long time ago. 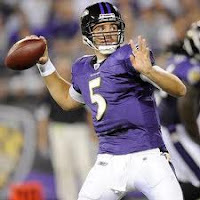 Flacco has a strong arm and is deceptively fast. And he had a better game than Brady yesterday. But he's just not there yet in terms of becoming an elite QB. And his season stats this year, on a per-attempt basis, seem to have been a step back. Still, he helps his team more than he hurts, and that's rare enough in the NFL. The thing people don't realize when they say Flacco has "regressed" or is not improving, is that the defenses he played week in and week out this year were off the charts. So strong in fact that I charted every elite/very good QB's opposing defenses from 98 on and in 2011 he faced the hardest one out of about 100 I looked at, and the only other one that was rally close was Eli Manning's rookie year....and we saw how that turned out. These "analysts" like to just throw out box score numbers with no context, when in football it is all about matchups. When you have to face every single top ten defense in the NFL, your numbers aren't going to be the same if you were playing the Patriots every week or weak defenses. It was almost unreal the defensive draw he was getting week after week, on top of playing in an offense that has a RB that demands attention and touches like few others. Flacco is right on track and ahead of where most year 4 QB's are, and that is if you look at the best of the best. It is incomprehensible how uninformed the media is about him, criticizing him for not putting up good fantasy football numbers in the box score. Oh and Brian, love the Sun/Preston comment in one of the other entries. I am from Towson and said to myself "this guy HAS to have a Baltimore connection to make a pinpoint accurate statement like that." Nice one, and right on the money.